alaTest ha raccolto ed analizzato 61 recensioni su Babyliss 7863U I-TRIM-Stubble. La media della valutazione per questo prodotto è 4.5/5, confrontata con la media della valutazione di 4.3/5 per altri prodotti. Abbiamo analizzato differenti valutazioni di esperti ed utenti, età del prodotto ed altri elementi. A confronto con altri prodotti, Babyliss 7863U I-TRIM-Stubble ha ottenuto un alaScore™ complessivo di 86/100 = qualità Molto buono. Good value product thats easy to use with great results. Does a great job of keeping my otherwise fairly shambolic attempts at stubble etc looking good without any risk of nicks/cuts. Very, useful. I bought the I-stubble Trim a couple of week's ago. Trims my stubble to a suitable length and doesn't take long. No good for real beards! Easy way to maintain stubble with various lengths. Fabulous product and great value. 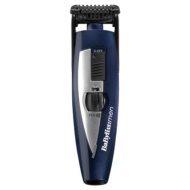 My husband just loves this trimmer with a good range stubble length adjustment. Excellent value. Bought this online, but apparently it's not suitable for my husband's type of beard, more just stubble, so have bought another Babyliss trimmer which is excellent. Wish they came with a travelling case, as the teeth tend to break off. Used my mates once, and wanted to buy one. Great beard trimmer with good battery life. The adjustable feature is really useful and convenient.